The storage landscape is evolving - moving from an expensive, proprietary model to embrace a software defined future. Even EMC acknowledge this shift with the introduction of ViPR ... so why not write about it! My previous post showed you how to get deduplication working on Linux with VDO. In some ways, that's the post that could cause trouble - if you start using vdo across a number of hosts, how can you easily establish monitoring or even alerting? So that's the problem we're going to focus on in this post. There are a heap of different ways to monitor systems, but the rising star currently is Prometheus. Historically, I've used monitoring systems that require clients to push data to a central server but Prometheus turns this around. With Prometheus data collection is initiated by the Prometheus server itself - it's called a 'scrape' job. This approach simplifies client configurations and management, which is a huge bonus for large installations. I'm leaving the installation of the exporter as an exercise for the reader, and use the rest of this article to show you how to quickly stand up prometheus and grafana to collect and visualise the vdo statistics. For this example, I'm again using Fedora so for other distributions you may have to tweak 'stuff'. With the directories in place for the persistent data within the containers, and the compose file ready you just need to start the containers. Run the docker-compose command from the directory that holds your docker-compose.yml file. To visualize the vdo statistics that Prometheus is collecting, Grafana needs two things; the data source definition pointing to the prometheus container, and a dashboard that presents the data. The grafana directory in the vdo_exporter project holds a file called VDO_Information.json. This json file is the dashboard definition, so we need to import it. 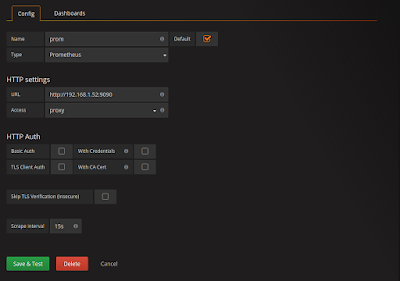 Click on the grafana icon again, highlight the Dashboards entry, then select the import option from the pop-up menu. Click on the Upload.json File, and pick the VDO_Information.json file to upload. As you add more hosts that are vdo enabled, just add the host's ip to the prometheus scrape configuration and reload prometheus. Simples..
Grafana provides a notifications feature which enables you to define threshold based alerting. You could define a trigger for low "physical space" conditions, or alert based on recovery being active - I leave that up to you! Grafana supports a number of different notification endpoints including PagerDuty, Sensu and even email! So take some time and review the docs to see how Grafana could best integrate into your environment. VDO is not the proverbial "silver bullet". The savings from any compression and deduplication technology is dependent on the data you're storing, and vdo is no different. Also, each vdo volume requires additional RAM, so if you want to move vdo out of the test environment into production you'll need to plan for additional CPU and RAM to "make the magic happen"™. Whether you're using proprietary storage arrays or software defined storage, the actual cost of capacity can sometimes provoke responses like, "why do you you need all that space?" or "OK, but that's all the storage you're going to get, so make it last". The problem is that storage is a commodity resource, it's like toner or ink in a printer. When you run out, things will stop and lots of people tend to lose their sense of humor. Controlling storage growth has been going on for over 10 years in the proprietary storage space, with one of the most successful companies being NetApp who introduced data deduplication with their ASIS (advanced Single Instance Storage) feature back in 2007. The message was that if you wanted to reduce storage consumption, you basically had to buy the more expensive "stuff" in the first place. This was the "status quo" until Red Hat acquired Permabit in mid 2017...now compression and deduplication features are heading towards a Linux server near you! That's the history lesson, now let's look at how you can kick the tyres on open sourced based compression and deduplication. For the remainder of this article, I'll walk through the steps you need to quickly get "dedupe" up and running with Fedora. Since we're just testing, create a vm and install Fedora 27. Use libvirt, parallels, virtualbox...whatever takes your fancy - or maybe just use a cloud image in AWS. The choice is yours! Just try to ensure the vm has something like; 2 vcpus, 4GB RAM, an OS disk (20GB) and a data disk for vdo testing. In my test environment, I'm using a 20g vdisk for my vdo testing. by default new volumes are created with compression and deduplication enabled. If you don't like that you can play with the --compression or --deduplication flags. a vdo volume is actually a device mapper device, in this case /dev/mapper/vdo0. It's this 'dm' device that you'll use from here on in. Now you have a vdo volume, next step is to get it deployed and understand how to report on space savings. The first thing is filesystem formatting. Make sure you use the -K switch to avoid issuing discards, remember a vdo volume is in effect a thin provisioned volume. With the filesystem in place, the next step would normally be updating fstab...right? Well not this time. For vdo volumes, the boot time startup sequence between fstab and the vdo service is a problem - so we need to use a mount service to ensure vdo volumes are mounted correctly. Reminder: mount services are named to reflect their intended mount location within the filesystem. At this point you've used the vdo command to create the volume, but there is also a command to look at the volume's statistics called vdostats. To give us something to look at I copied the same 200MB disk image to the volume 20 times, which will also help to explain vdo overheads. Wait a minute...at a logical layer, the filesystem says that it's 4.5G used, but at the physical vdo layer it's saying practically the same thing AND that there's a 95% saving! So which is right? The answer is both :) The vdo subsystem persists metadata on the volume (lookup maps etc), which accounts for a chunk of the physical space used, and the savings value is derived purely from the logical blocks "in" and the physical, unique blocks written. If you need to understand more you can dive into the sysfs filesystem. In my case, the "overhead_blocks_used" was 4GB, and the "data_blocks_used" around 200MB. The savings% value is derived from data_blocks_used / logical_blocks_used, since it only applies to actual user data written to the volume, which equates to around 95%. Now it makes sense! Deduplication is a complex beast, but hopefully the above will at least get you up and running with this new Linux feature. Want to Install Ceph, but afraid of Ansible? There is no doubt that Ansible is a pretty cool automation engine for provisioning and configuration management. ceph-ansible builds on this versatility to deliver what is probably the most flexible Ceph deployment tool out there. However, some of you may not want to get to grips with Ansible before you install Ceph...weird right? If you're short on time, or just want a cluster to try ceph for the first time, a more guided installation approach may help. 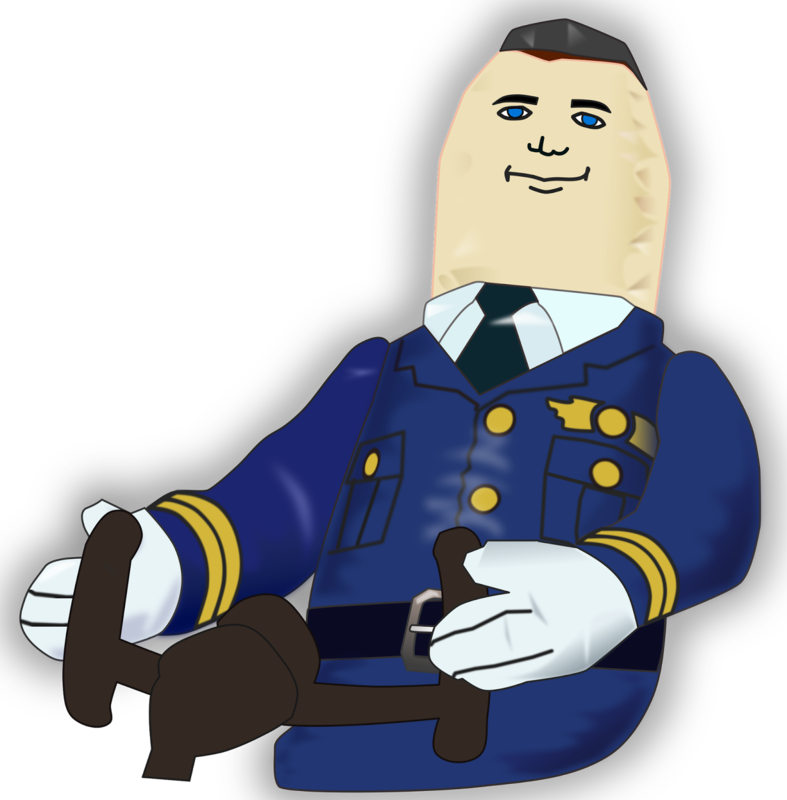 So I started a project called ceph-ansible-copilot. The features and workflows of the UI are described in the project page's README file. The process below describes each of these steps using CentOS7 as the deployment target for Ansible and the Ceph cluster nodes. Call me lazy, but I'm not going to tell you how to build vm's or physical servers. To follow along, the bare minimum you need are a few virtual machines - as long as they have some disks on them for Ceph, you're all set! Typically for a Ceph cluster you'll want to designate a host as the deployment or admin host. The admin host is just a deployment manager, so it can be a virtual machine, a container or even a real (gasp!) server. All that really matters is that your admin host has network connectivity to the hosts you'll be deploying ceph to. Here's a screen capture showing the whole process, so you can see what you get before you hit the command line. The video shows the deployment of a small 3 node ceph cluster, 6 OSDs, a radosgw (for S3), and an MDS for cephfs testing. 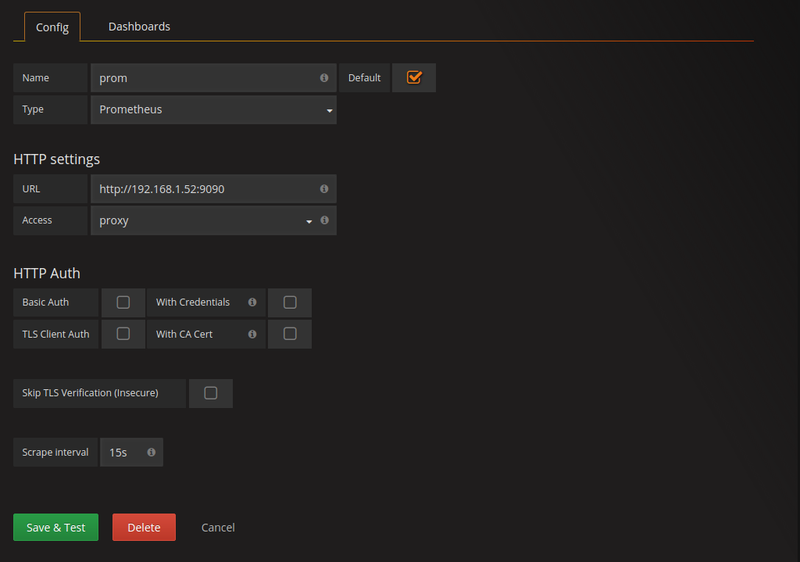 It covers the configuration of the admin host, the copilot UI and finally a quick look at the resulting ceph cluster. The video is 9mins in length, but for those of us with short attention spans, here's the timeline so you can jump to the areas that interest you. So far I've only tested 'simple' deployments using the packages from ceph.com (community deployments) against a CentOS target. So like I said, more testing is needed, a lot more...but for now there's enough of the core code there for me to claim a victory and write a blog post! handle the passwordless ssh setup. copilot already checks for passwordless ssh, so instead of leaving it to the admin to resolve any issues, just add another page to the UI. 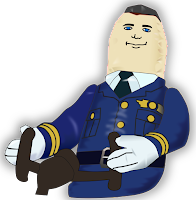 That's my wishlist - what would you like copilot to do? Leave a comment, or drop by the project on github. Recently I've been working on converging glusterfs with oVirt - hyperconverged, open source style. oVirt has supported glusterfs storage domains for a while, but in the past a virtual disk was stored as a single file on a gluster volume. This helps some workloads, but file distribution and functions like self heal and rebalance have more work to do. The larger the virtual disk, the more work gluster has to do in one go. The shard translator was introduced with version 3.7, and enables large files to be split into smaller chunks(shards) of a user defined size. 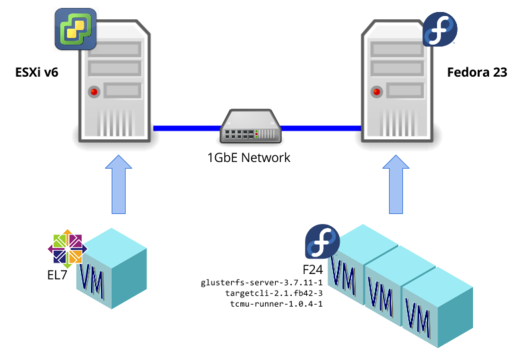 This addresses a number of legacy issues when using glusterfs for virtual machine storage - but does introduce an additional level complexity. For example, how do you now relate a file to it's shard, or vice-versa? The great thing is that even though a file is split into shards, the implementation still allows you to relate files to shards with a few simple commands. And now, let's go the other way. We start with a shard, and end with the parent file. ensure gluster's systemd unit(s) start within the correct slice. So let's look at how this is done. Try the 'systemd-cgtop' command to show the cpu usage across the complete control group hierarchy. And now the obligatory warning. Introducing any form of resource constraint may resort in unexpected outcomes especially in hyperconverged/collocated systems - so adequate testing is key. In the past, gluster users of have been able to open up their gluster volumes to iSCSI using the tgt daemon. This has been covered in the past on other blogs and also documented on gluster.org. But, tgt has been superseded in more recent distro's by LIO. LIO provides a number of different local storage options to be utilised as SCSI targets, including; FILEIO, BLOCK, PSCSI and RAMDISK. These SCSI targets are implemented as modules in kernel space, but what isn't immediately obvious is that LIO also provides a userspace framework called TCMU. TCMU enables userspace files to become iSCSI targets. With LIO, the easiest way to exploit gluster as an iSCSI target was through the FILEIO 'storage engine' over FUSE. However, the high number of context switches incurred within FUSE is likely to reduce the performance potential to your 'client' - especially for random I/O access patterns. Until now, FUSE was your only option. But Andy Grover at Red Hat has just changed things. Andy has developed tcmu-runner which utilises the TCMU framework, allowing a glusterfs target to be used over gluster's libgfapi interface. 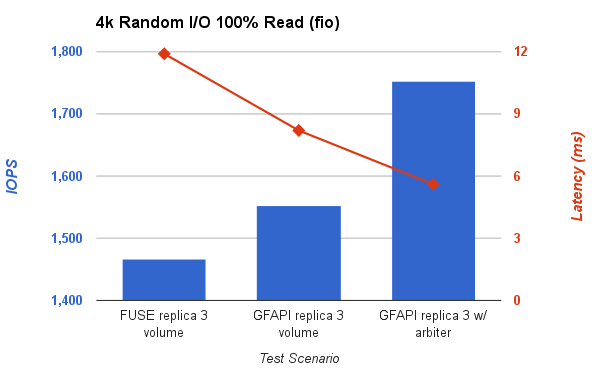 Typically, with libgfapi you can expect less context switching, and improved performance. For those like me, with short attention spans, here's what the improvement looked like when I compared LIO/FUSE with LIO/gfapi using a couple of fio based workloads. 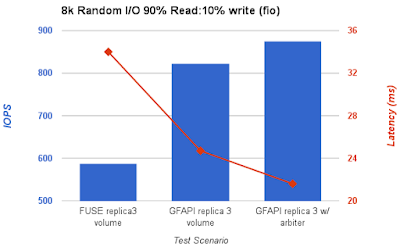 In both charts, IOPS and latency significantly improves using LIO/GFAPI, and further still by adopting the arbiter volume. For the remainder of this article, I'll walk through the configuration of LIO and the iSCSI client that I used during my comparisons. on each node, ensure /etc/gluster/glusterd.vol contains the following setting - option rpc-auth-allow-insecure on. This is needed for gfapi access. Once added, you'll need to restart glusterd. Before moving on, you can confirm that targetcli/tcmu-runner are providing the gluster integration by simply running 'ls' from the targetcli. With the preparation complete, let's configure the LIO gateways. The following steps provide an example configuration. You'll need to make changes to naming etc specific to your test environment. Enter the targetcli shell. The remaining steps all take place within this shell. When a LUN is defined by targetcli, a wwn is automatically generated for it. This is neat, but to ensure multipathing works we need the LUN exported by the gateways to share the same wwn - if they don't match, the client will see two devices, not two paths to the same device. So for subsequent nodes, the steps are slightly different. On the first node, look at /etc/target/saveconfig.json. You'll see a storage object item for the gluster file you've just created, together with the wwn that was assigned (highlighted). With the LUN in place, you can follow steps 4-7 above to create the iqn, portal and LUN masking for this node. To get the client to connect to your 'exported' LUN(s), you first need to ensure that the following rpms are installed on the client; device-mapper-multipath, iscsi-initiator-utils and preferably sg3_utils. With these packages in place you can move on to configure multipathing and connect to you LUN(s). # I tested with a path_selector of "round-robin" and "queue-length"
You can see in this example, I have three LUN's exported, and each one has two active paths (one to each gluster node). By default, the iscsi node definition in (/var/lib/iscsi/nodes) uses a setting of node.startup=automatic, which means LUN(s) will automagically reappear on the client following a reboot. The highlighted text shows the configuration string you specified when you created the LUN in targetcli. If you run the same command against the devices themselves (/dev/sdf or /dev/sdg) you'd see the connection string from each of respective gateways. Nice and easy! Wow - it's been a while since my last post! Recently, I needed to configure glusterfs with SSL and found that the documention that describes how to do it is actually pretty thin. What's annoying is that this feature has been around since 2013! This step creates a private key(.key) and associated certificate(.pem) on each node. The common name (CN), I've used is the hostname, so each certificate is unique to each gluster node and/or client. You may opt for a different scheme - but the important thing is the CN chosen here is reflected in step 6. The comma separated list should consist of the CN's used when generating the .pem files on each host, from step '1'. That's it - enjoy a more secure glusterfs!